In the worst kept secret of the festival we are happy to announce that Hal Brolund is the final international act to perform at SPRUKE Brisbane’s Ukulele Festival 2017. Canadian blues artist Manitoba Hal has forged an international reputation for engaging and connecting with his audience through songs that are mournful, hopeful, silly, romantic and introspective. He proves that the ukulele can be small but mighty as he pulls out powerful blues riffs and melodies adding subtle important accompaniment using looping technology. Hal joins Kyas Ryo from Japan and the ‘Alaskan Wild Man’ Ukulele Russ along with homegrown artists, Tyrone and Lesley and The Pockets, for SPRUKETACULAR the opening concert for the festival on Friday 29 September. 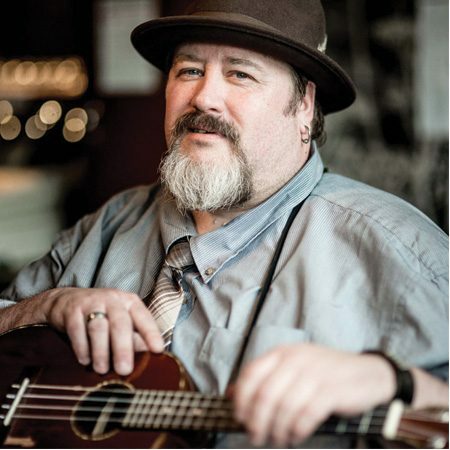 Hal’s workshops were a sell-out when last he toured, headlining at SPRUKE in 2013, and in 2017 festival-goers have two workshop opportunities to be inspired by Hals’ approach to Blues on the ukulele. Finally in a not to be missed experience, The Morris Brothers Festival Finale Concert on Sunday afternoon will have all the international acts onstage performing together. Program and Workshop tickets to be announced very soon.